Whether you’re a frequent golfer or have never even hit a ball, Pennsylvania is the perfect place to practice your swing. 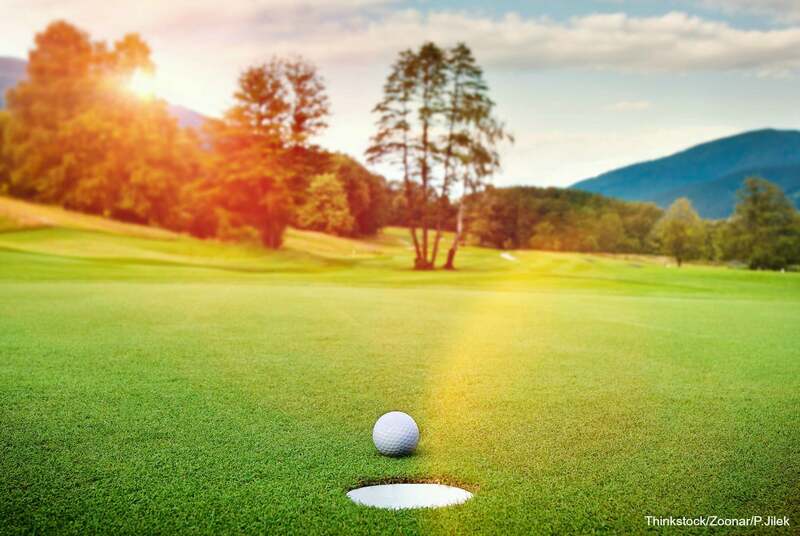 Situated amongst lush forests, open fields, and the looming peaks of the Poconos, PA golf courses offer challenging terrain and jaw-dropping views that provide a day of fun and adventure for golfers of all skill levels. The next time you stay at the Sayre Mansion, head to the green for an afternoon of relaxation and excitement! Here are some of our favorite places to play. With elevated tees, sloping fairways, and challenging water hazards, Iron Lakes Country Club is the perfect place to test your golf game. The club was constructed in the late 50’s and early 60’s and is located on the grounds of an old iron ore mine, where century-old trees abound. Iron Lakes holds the distinct honor of the toughest hole in the Valley and recently added Yellow Tees to meet the needs of all levels of ability. The course also features a fully-stocked pro shop, Golfers Hickory Grill, and multiple reception facilities. Just minutes from Bethlehem and Allentown, Wedgewood Golf Course offers 27 holes for golfers in the heart of Lehigh Valley. The original 18 holes opened in 1963, and an addition nine were added in 2000. Today, guests can play one, two, or all three courses, tee off at the expansive 40-acre driving range, or grab some new gear at the pro shop. Wedgewood also welcomes tournaments and charity events and offers picnic groves with covered pavilions for your next golf outing. Opened in 1954, Locust Valley Golf Club was designed by William F. Gordon and is a 6,716-yard public course that used to be a private country club. The 18-hole layout is both challenging and fun and features flat greens and a few tight fairways. Guests can also enjoy the snack and bar area, beverage carts, and a fully-stocked pro shop. This course can be crowded in the morning, so we recommend playing later in the day if you prefer a quieter round. Willow Brook Golf Course is a beautifully maintained 18-hole course that winds around Catasauqua Creek and features 5,800 yards of willow, pine, and sycamore trees. Perfect for golfers of every level, the fairways are fully irrigated and the greens are consistent, smooth, and fast. Feel free to warm up at the driving range and putting green, take a private golf lesson, or simply relax with a refreshment and food in the Willow Grill. The course also has a pro shop and a wide variety of high-quality golf accessories. Come Home to the Sayre Mansion! Before you head out for a day of fun in the sun, be sure to book your stay at our Bethlehem bed and breakfast! Our inn is just minutes from the best PA golf courses and is the perfect place to recharge between each game, with amenities like comfortable rooms and suites, beautiful gardens and grounds, and a complimentary gourmet breakfast to fuel you up each morning. We can’t wait to hear all about your golf experience in Lehigh Valley!